Your breath-taking adventure begins with a relaxing drive through the wonderful Costa Rican countryside on an air-conditioned vehicle for up to 20 passengers to guarantee professional and personalized service. Your guide will point out many sights of interest including mango, sugar and citrus plantations, diverse fruit stands and rural farming communities. You will be heading to Herradura Bay until you arrive at our private reserve, about 1 hour drive from the pier. Upon arrival to our beautiful property, you will have some free time to use restrooms and explore the surroundings before to beginning the rainforest nature walk. The adventure starts on a 15-minute ride aboard our specially designed 40-passenger tractor. Once we arrive to the top of the mountain, you will have spectacular views of the Herradura Bay and Island, as well as the Nicoya Gulf. 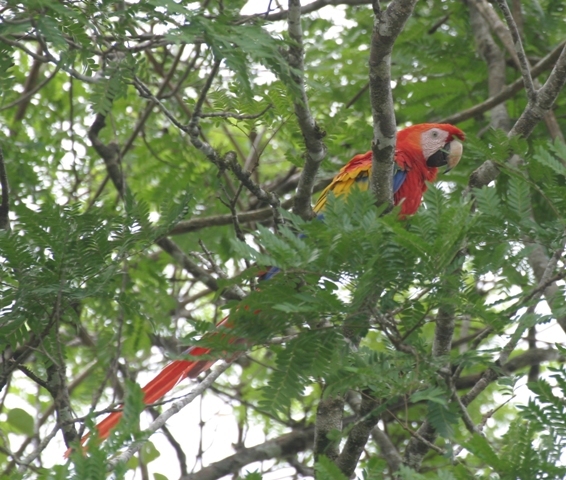 Within the property, you will have the opportunity to view the Scarlet Macaws, Chestnut Mandible Toucans and whiteface monkeys. The property rests on 80 acres of land... 50% of which is primary forest. Once at the entrance of the trail, our naturalist tour guide will be heading the expedition into the rainforest. During the 45 minutes and 0.7 mile downhill nature walk, you will learn about tropical ecology, biodiversity, local flora and fauna and many other interesting aspects of this unique and particular ecosystem. At the end of the trail, a butterfly garden with hundreds of beautiful insects will compliment the visit before enjoy some fresh tropical fruit and cold water. Continuing our tour, you will be heading to Tarcoles River, where from the bridge you will be able to admire many American Crocodiles. During this short stop, you can take pictures! Usually at this point we easily find as many as 20 or 40 crocodiles every day. Continuing our tour, you will visit El Jardin Souvenir Store & Restaurant. This is beautiful souvenir’s store and Art Gallery with excellent products. Here, free time is allowed for shopping and lunch at the restaurant, where delicious typical and international dishes are offered for an excellent price. You can taste the typical dish of Costa Rica, El Casado, a plate that combines rice, beans, vegetables, fried plantain and a meat of your selection (chicken, steak, fish) for an affordable price of . (Lunch is not included in the tour’s rate). Note: This tour is highly recommended for the whole family, including seniors and children. However, participants must be able to walk at least 0.7 mile in a tropical climate.